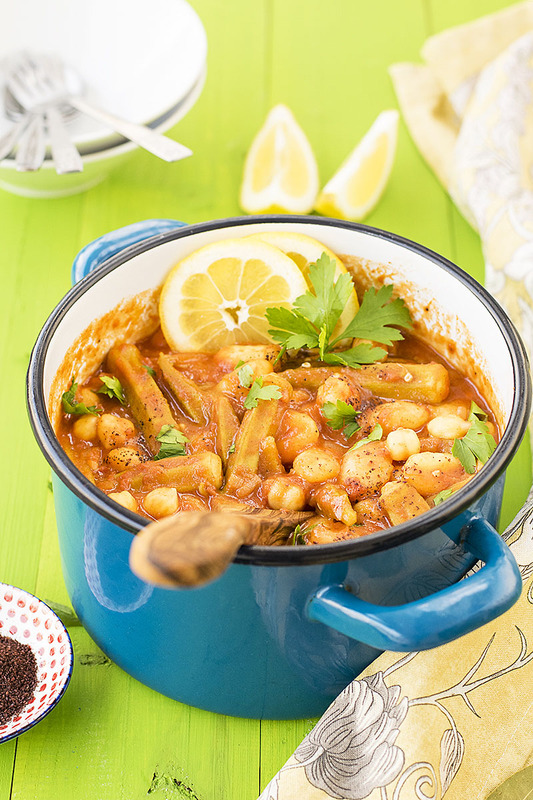 This vegan Greek gumbo with okra, gnocchi, and chickpeas is a simple and flavorful dish. Μade in less than 30 minutes, it’s ideal for a weeknight dinner. 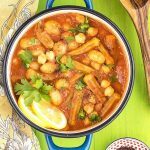 This Greek gumbo recipe is a great example of the Mediterranean way of cooking that shows us how to make healthy and tasty dishes with a few, simple ingredients. 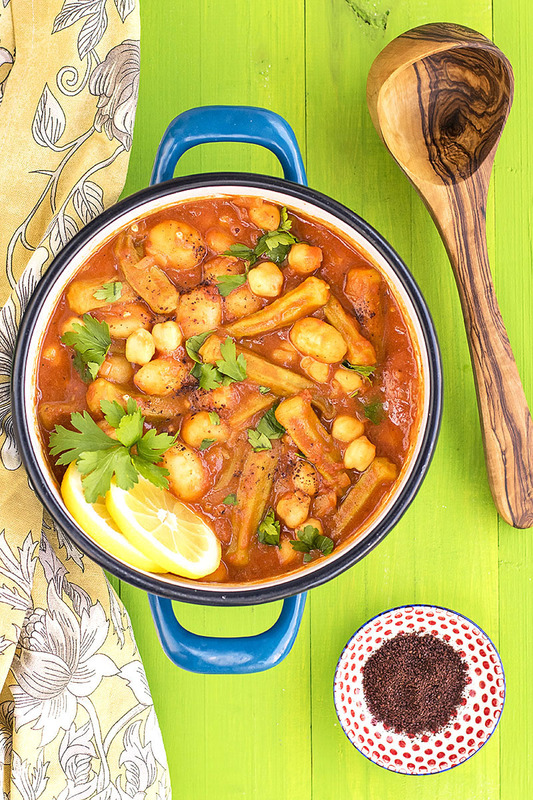 However, chickpeas are not normally used with okra, but I find that they pair very well with this recipe, and they’re also a great way to add some plant-based protein 🙂 . If you want to make this recipe gluten-free, you can use gluten-free gnocchi or just substitute cubed potatoes. In this case, you should cook the potatoes from the start, along with the okra. OK, I have a confession to make. In Greece, this recipe is not called gumbo. 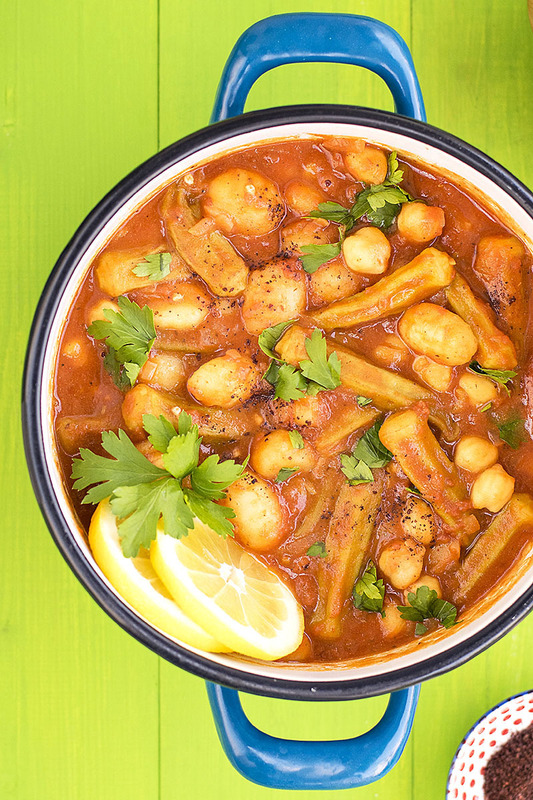 But I decided to call it that because when I first heard of it I was intrigued since it reminded me of some Cretan stews with okra. So we actually don’t call this recipe “gumbo” and probably a lot of Greek people never have heard of this term before. According to my mom, a fitting name would be “a stew with okra and gnocchi” or just “okra with gnocchi”. Okra and tomatoes are a classic Greek combination. One of my most favorite recipes is a chicken stew with okra and pureed tomatoes which my mom calls “chicken with okra”. Simple and easy to understand, right? 🙂 The cooking method is similar to this whole chicken cacciatore stew with bucatini pasta but without the pasta and with different spices. When okra is cooked with tomato juice or pureed tomatoes, the acidity of the tomatoes doesn’t let it get “slimy” (fact verified by Southern Living and many more, my grandma included!). Probably that’s the reason why freshly squeezed lemon juice is also used. And I have to say that the tanginess of the lemon brings out the fresh and summery character of the okra! How much lemon juice to use? The Mediterranean spirit demands that okra should be tangy. If you’re not sure how you like it, start with less lemon juice and adjust by taste. If you can’t find gluten-free gnocchi, use an equal amount of potatoes, peeled and diced. Frozen okra is a great option for this recipe. Use baby okra if possible. If you’re not used to eating legumes and okra often, then expect some bloating and gas. Some people like to use garlic in this recipe, but I find it overwhelming. If you desperately need it, you can add 1 whole garlic clove to the pot, 1 minute before you add the pureed tomatoes. 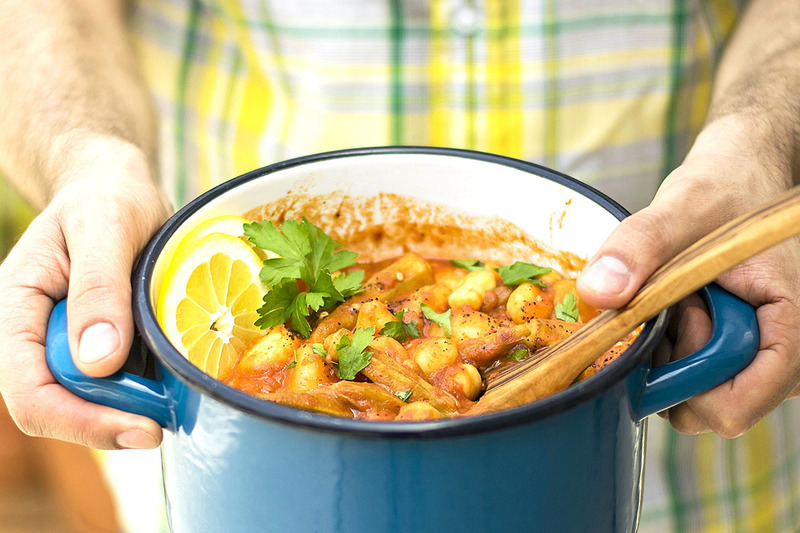 This Greek gumbo with okra, gnocchi, and chickpeas is a simple, tasty, and flavorful dish, ideal for a weeknight dinner since it can be made in less than 30 minutes! Transfer the olive oil, the onion, the okra, the bay leaf, the allspice, and the paprika to a pot and cook over medium/high heat until the onion is translucent (about 5 minutes). Add the wine, the pureed tomatoes, and the lemon juice and reduce heat to a gentle simmer. Cover and cook for 15-20 minutes, depending on how soft you like the okra. Add the parsley, the chickpeas, the gnocchi, the salt, and the pepper (also add the sumac and the sugar, if using). If the sauce is too thick you may have to add a splash of water. Cover the pot and cook for another 5 minutes. If you can’t find gluten-free gnocchi, use an equal amount of potatoes, peeled and diced. In this case, you should cook the potatoes from the start, along with the okra. 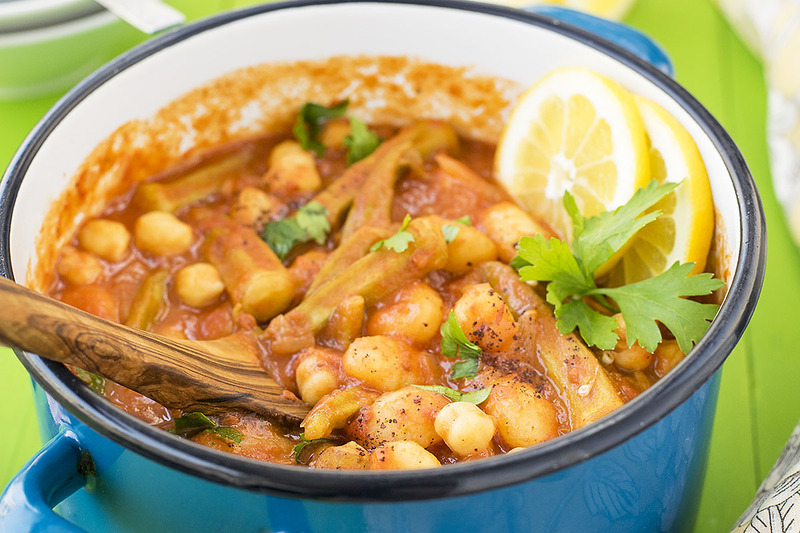 If you don’t want to use canned chickpeas, soak 100 grams of dried chickpeas overnight with 3 cups water and half a teaspoon baking soda. Rinse them well and boil in a pot with fresh water until tender. This food will thicken as it rests. If you need to re-heat it, you’ll have to add some water to thin out the sauce. I have eaten a lot of okra recipes before but nothing like okra and chickpeas. It really looks interesting, Thanks for sharing this wonderful recipe. Thank you Akhila, I’d love to know how you prepare okra!